Quickly Turn Basic Ingredients and Spices Into Juicy, Super-Delicious Meals For Your Family! 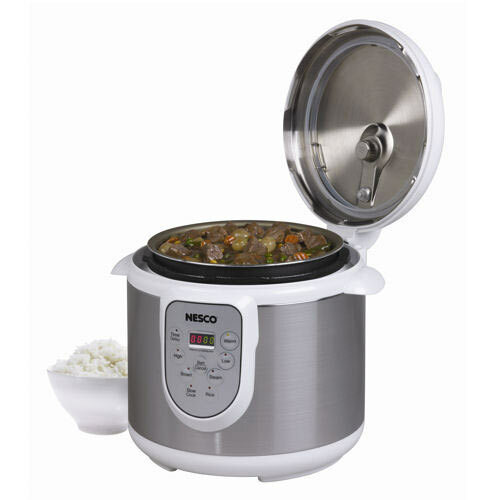 Meals Are Incredibly Fast & Easy With Your Nesco Pressure Cooker. Meal Prep and Cleanup are a Breeze So You’ll Enjoy More Free Time for Other Things! Pressure cooking your food is one of the healthiest ways to cook, because it retains more vitamins and minerals than by any other cooking method. The color of your vegetables remain bright and deep, giving your family the extra nutrients they need. Pressure cooking preserves flavors, making food tastier, as it speed-cooks tougher, inexpensive cuts of meat into fall-apart tender, juicy masterpieces for your family. It’s ideal for making delicious home made soups, stews, chili and more. Cook fish, chicken and vegetables to perfection in minutes. A plug-in electric cooker means you won’t have turn on the stove burners during the summer heat. It’s all self contained and super efficient. Working on a tiny trickle of electricity, you cook your entire meal for pennies of energy, adding minimal heat to your kitchen in the summer, and always saving you money. You can run the air conditioner less, and cooking will be more enjoyable, so you’ll be happier. A Pressure Cooker is a sealed and heated, pressurized vessel. As the pressure inside increases, the boiling point of the liquids increase, allowing the temperature to rise higher than normal boiling temperature. This cooks foods up to 70% quicker than conventional methods. Nesco’s cookers cooks food at a full 10 lbs. of pressure on the high setting. Many electric pressure cookers don’t pressurize that much and aren’t as effective as Nesco’s. Any recipe written for a stovetop pressure cooker can easily be prepared ‘AS WRITTEN’ in these units while using the high pressure setting, so you can take advantage of all the free stove top pressure cooker recipes available. Nesco cookers cook incredibly fast, so it’ll free up your time for the things that you want to do. Get a jumpstart on dinner. Use the programmable digital timer to precisely time the meal to exact times, where you can automatically set it to keep the food warm after cooking, or to turn off. You can also set it to delay cooking for up to eight hours, so that you can throw some ingredients together in the morning and it’ll be cooked and ready when you get home later. You can easily program your Nesco cooker, and still be able to attend that event away from home. This is a true set-it and forget it way to cook! You’ll spend much less time and effort fixing your meals. Prep-time is easier and shorter, and cook-time is 3 to 10 times faster than conventional cooking. Cleanup is a breeze, so you’ll also spend much less time and effort on cleanup, freeing up even more time for yourself! It’s great for busy people like you! No need to worry about scalding. With Cool-touch lid and handles you can move your cooker at anytime while cooking, so you won’t accidentally burn yourself. At any point you can choose to depressurize the cooker automatically, or manually. Either way, a self-locking lid makes sure pressure has dropped to a safe level before allowing the lid to open. You can safely use the quick release method to depressurize the pot so you can add vegetables to the meat, or to can check the food for doneness. With Nesco’s easy-to-program digital timer, you can set it and forget it, knowing you won’t under or overcook your meal. It’s cooked to perfection every time. Unlike other brands, you have the flexibility to either use the quick timer presets, or the option to program the timer manually, so you’re not stuck having to use only pre-programmed settings. This gives you the freedom to set it how you want it. The easy to read LED display let’s you instantly know how much more cook-time is left, so you’re not wondering when your food will be done. You can easily time other side foods with the rest meal, and easily time the meal around your family’s schedule. Nesco’s Soft Touch buttons gives your cooker an elegant, quality, and comfortable feel. 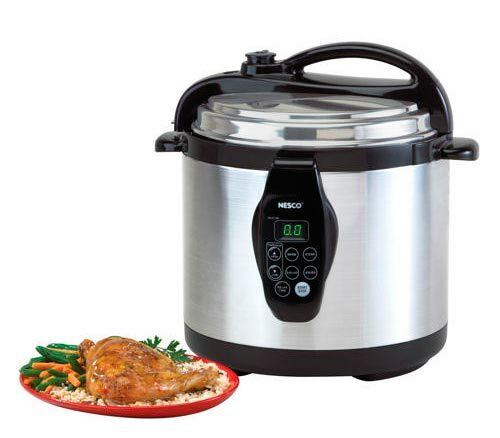 Nesco Pressure Cookers offer the flexibility of two pressure settings, high pressure to cook denser food like meats and vegetables, and low pressure for less dense food, like fruits. Whether it’s the main meal or deserts, you and your family will enjoy delicious dishes, perfectly cooked every time. The 3-in-1 models, feature three modes, a pressure cook mode, a slow cooker, and a steamer, all in one easy-to-use appliance. The 4-in-1 models also include a Rice Cooker feature, although you can easily cook rice in the 3-in-1 using the steam function. Save your storage space and money for other things. No need to buy and store all these appliances. You can use the slow cook mode for your favorite crock pot recipes, or use the pressure cook mode to speed things up. Vegetables and rice come out perfectly steamed retaining the most flavors and vitamins! Although they come in a 4-Liter capacity, the 6-Liter cookers are large enough for a complete family dinner, yet still small enough not to be cumbersome. All models are convenient to use and easy to clean up, giving you more time for yourself. A removable, non-stick Cooking Pot insert, evenly distributes heat during cooking. For cleanup, remove it from the base. Its non-stick coating is very easy to wash by hand, and is dishwasher-safe, so post-meal cleanup is a breeze, cutting down on cleanup time. It’s as easy as wipe, rinse & done, so you’ll have more time for the things you want to do. Special features include a Brown function, which allows you to brown cuts of meat before pressure cooking for better flavor. The Steam function brings water to a boil quickly for steaming foods like fresh vegetables and for cooking rice. The Slow cook function acts just like a crock pot, so you can cook your food very slowly to bring out the best flavors. While programming the cook-time, you can either have it automatically turn off, or you can have it switch automatically to a Warm mode, which will keep your food warm and ready for when you are. This means you can set it and forget it, without worrying about burning. The warm mode also gently re-warms food later on. A slow cooker can be left unattended all day for many recipes, and due to its safety features and timer, your Nesco can also pressure cook your meals unattended. Just add recipe ingredients in it before leaving and come home to a complete hot meal, ready to dig in to. These appliances are so versatile that you can use it for all the hundreds, or even thousands of freely available crock pot recipes and pressure cooker recipes! You can gently tenderize meats and vegetables, while retaining the delicious flavors of your ingredients. With brushed stainless steel exteriors, they’re attractive and durable appliances that will save you time and effort. With the popularity of pressure cookers , I am disappointed in the lack of recipes. The instruction book had 11 recipes. It would be nice if you included a small recipe book with purchase. Where can I get a recipe book for the Nesco 11 qt electric pressure cooker? I’ve looked everywhere online and can’t find recipes. I’m sure your meal will turn out great. 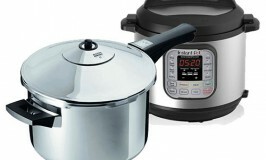 You should be able to use any pressure cooker recipes with this cooker. I get my recipes on Pinterest. I am using the crock pot method and I set it for 4 1/2 hours but my red light keeps flashing. It’s still counting down the time though. I’m not sure what I’m doing wrong. Any help would be great. 1. Make sure the steam release handle is open in the “Venting” position. 2. Plug in and turn on. The LED display shows “OFF”, meaning that it’s in a standby state. 3. Press the “Slow Cook” button. 4. Press the + or – to change the cooking duration. 6. Cooking starts automatically 10 seconds after the last key is pressed. 7. When the cooking finishes, the cooker beeps and goes into the Auto “Keep Warm” cycle. I’d turn it off because there’s enough heat in the stew to keep it hot for quite a long time. I sure hope this helps. Thank you so much. I’ll try that. Thanks for the question. Yes, you may absolutely use your pressure cooker for cooking green beans! Here’s a great and simple recipe for quickly making a delicious green bean side dish with your dinner. Green beans are a family favorite. Your pressure cooker can make them perfect in just minutes! This works with frozen green beans too. 1. Place Water, Green Beans, Salt, Garlic and optional bacon into your pressure cooker and stir. 2. Cover and bring cooker to pressure. Reduce heat to the lowest temperature setting. 3. Cook for 3 to 4 minutes. If you want the beans soft, cook 5 minutes. 4. Remove from heat and allow to cool for 5 minutes. 5. Depressurize and drain water. 6. Melt butter into beans and stir to coat evenly. Can I use my pressure cooker to can beans? Can I pressure can vegetable & frits in my Nesco cooker? Any suggestions? Can you reply via e-mail? Hi Pat, Thank you so much for commenting! I’m very pleased your Chicken Cacciatore turned out great. yes, “easy” is what I had discovered too. It’s pretty hard to mess this one up. I am working to add more easy and delicious pressure cooker recipes to the website.